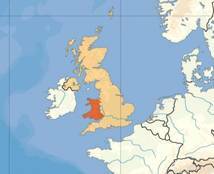 Wales is the part of United Kingdom, bordered by England to its east and Irish Sea to west. It consists of Nort Wales and South Wales. South Wales is more industrialised region, and about 70% of the population lives there. North Wales is beatiful land of mountains and lakes, beloved by tourists. There are three national parks(Snowdonia, Brecon Beacons, and Pembrokeshire Coast). The highest mountain is Snowdon ( 1085 m ).Spring of the river Severn ( 354 km ), which is longest river in Great Britain, is situated in Wales. The capital city is Cardiff ( 800 000 population ), it’s also the biggest city. Population of Wales is 3 milion people. What is interesting, population of sheep is about 4 times bigger – 11 milions. The roots of Wales inhabitants are older than a lot of other civillizations. Wales is ancient land – there are proofs that some Welsh buildings are 1500 years older than pyramids ! Country had been conquered by Romans in 78 AD and christianizated in V century. After turbulent hundreds of years, in 1287 Wales gave up under English rule ( The last Welsh king, Gruffyd ap Cynan died in uprising in 1282 ). Englad and Wales become one kingdom in 1636. 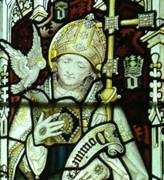 Sain David was a Welsh Bishop during the 6th century; he was later regarded as a saint and as the patron saint of Wales. David was a native of Wales, and a relatively large amount of information is known about his life. However, his birth date is still uncertain, as suggestions range from 462 to 512. It is claimed that David lived for over 100 years, and he died on a Tuesday 1 March (now St David’s Day). It is generally accepted that this was around 590,The monastery is said to have been ‘filled with angels as Christ received his soul.’ St Davids Cathedral is one of the most venerable Christian sites in Britain. The Welsh Dragonis popularly supposed to have been the battle standard of King Arthur and other ancient Celtic leaders. Leek and Daffodil – national emblems of Wales. Colour symbolize Wales – RED. Eisteddfod – great celebration of Welsh culture, oneof the biggest folk festivals in Europe. It is in August. Most common names in Wales: Price, Morgan, Rees, Jenkins, Jones, Evans, Lloyd, Williams, Thomas, Davies. Many well known people came from Wales: George Everest, Anthony Hopkins, Catherine Zeta Johnes. Llanfairpwllgwyngyllgogerychwyrndrobwllllantysiliogogogoch (ang. St Mary’s Church in the Hollow of the White Hazel near a Rapid Whirlpool and the Church of St. Tysilio near the Red Cave) is the longest name of the city in the world. Sut mae? – How are you?